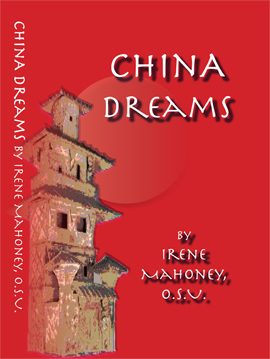 China Dreams is a novel by Irene Mahoney, who taught English language at a college in Taiwan. Her experience there opened horizons regarding human interaction in a global society. In this fictional narrative, the first-person narrator goes to Taiwan as a teacher, where she faces the sharp differences between her American culture and that of the people she encounters at Ho Ping school. The narrative form enables a personal look at how interaction between different perspectives, customs, and histories plays out in everyday living. Sister Irene Mahoney is the author of historical biographies including that of Marie of the Incarnation, Henry of Navarre, and Catherine de Medici. She has written accounts of the founding of Ursuline communities and ministries in China, Thailand, and Montana. Her fiction writing includes four novels including a mystery, Seven Sons, and most recently Solo Voices: A Novel of Forgiveness. Currently retired, Irene Mahoney continues to write. She is presently living on the campus of The College of New Rochelle with a community of Ursuline Sisters. BOOKS BY IRENE MAHONEY, O.S.U.